Director of the Devil May Cry series and Dragon's Dogma, Hideaki Itsuno enthusiastically spoke of his dream to make a sequel to Dragon's Dogma. "We were only able to use about 60 to 70 percent of the ideas we had for the game. There's so much we still want to do." said Itsuno. One of the potential ideas still on the back burner would be to give pawns (servant characters that players can share with other players) quests that other players can play, as well as newer jobs and races. Gouichi Suda, better known in the West as Suda 51, spoke of his company, Grasshopper Manufacture, and his wish for it to grow as a game company beyond what he himself has done. "I thought about this for years and have been taking steps, but I believe that the name ‘Grasshopper' cannot mean ‘Suda.'" Spoke Suda, emphasizing the need for the Grasshopper name to become its own brand. While he could not reveal much at this point in time, Suda spoke of his plans for the future. "I'm looking to strengthen the Grasshopper team while simultaneously working as one game designer." Producer for Tecmo Koei's Dynasty Warriors Multi Raid series, Kenichi Ogasawara spoke of the Tecmo Koei's hopes for a third pillar Warriors series. Tecmo Koei has recently been branching out and pulling in multiple IP brands to its Warriors formula. Gundam, One Piece, Fist of the North Star… Still it has yet to find a strong series that stands on its own like the Dynasty Warriors series and Samurai Warriors series. Said Ogasawara, "I've long thought about the ‘reality of battle.' I believe that an open world game is the ideal format to depict that." The potential of a Grand Theft Auto or Elder Scrolls like open world with full Dynasty Warriors or Bladestorm like combat seems like a pretty ambitious and awesome idea. 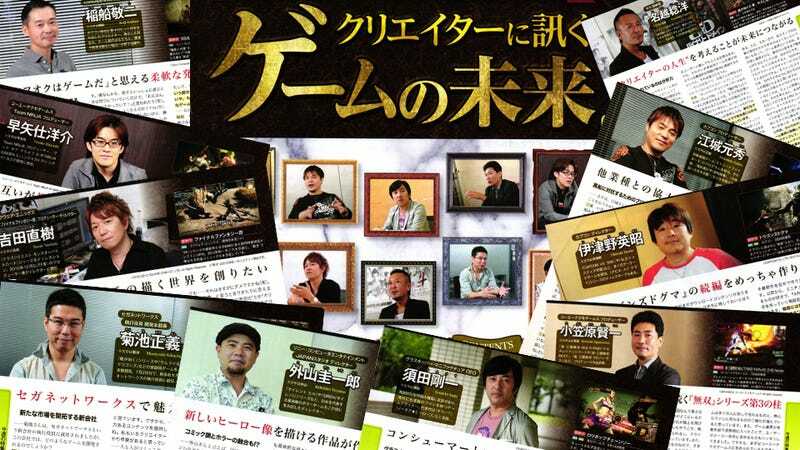 Other people interviewed in this week's issue were Motohide Eshiro of Capcom, Yousuke Hayashi of Team Ninja, Keiji Inafune of comcept/intercept, Naoki Yoshida of Square Enix, Toshihiro Nagoshi of Sega, Masayoshi Kikuchi of Sega, and Keiichiro Toyama of SCEJ.